This Just For Kids Science Newsletter includes a question of the month, current science events, science trivia and a simple science experiment. Bats are very important because they eat insects as they fly around at night. Do you know how many insects they can consume each night? A Canadian scientist discovered probably the world's largest beaver dam on the southern edge of Alberta Canada's Wood Buffalo National Park. The scientist discovered the 2800-foot structure while studying Google Earth maps. The previous record for a beaver dam was a 2,140-foot structure in Three Forks, Montana. The area is so remote that it is almost impossible to visit on foot so visitors to the region will be few and far between. Scientists used airplanes to confirm the dam's existence. They believe that several generations of beavers have been building the dam since the 1970s. In the African savanna of Kenya tiny termite colonies have been living for centuries creating oasis that attract a wide variety of animals compared to the surrounding plain. The lush circles of grass surrounded by Acadia trees are between 30 and 100 feet across filled with fertile soil. The termites cultivate fungus and eat dead plant material making the soil so rich that farmers plant crops on top of them. Scottish bird-watchers have discovered a gyrfalcon living on the Isle of Lewis since late April. The falcon has a wingspan of approximately 6 feet. It is believed that the eruption of Iceland's Eyjafjallajokull volcano caused the falcon to move to Scotland until the eruption is over. Many geese living in the Outer Hebrides instead of migrating to the Arctic to raise their young are remaining on the islands due to the eruption. Sloths traveling at top speed would take a month to travel one mile. A British website has started selling selling land on Venus and Mars. They are charging about $29.00 and acre. I haven't heard if they have sold any yet. A 6,000 gallon milkshake was created by a restaurant owner. It was large enough to fill more than 100 bathtubs. Baseballs travel through the air faster if they are thrown during hot weather in a baseball game. If you watch baseball you might start recording the speed of your favorite pitcher's fastballs during hot and cold weather. Airplanes need lift and thrust to move through the air. In this activity you will make a simple airplane using a few simple materials to create an airplane that can fly 30 of more feet. Cut a piece of paper 1/2 inch wide and 8 1/2 inches long. Tape the two ends together with scotch tape. Cut a second piece of paper 1/2 inch wide and 6 1/2 inches long. Tape the ends together of the second strip of paper. Lay the loops on a table and place the straw inside the loops. Tape the loops to the straw. Place your pointer finger on the back end of the straw near the larger loop and hold the rest of the straw with 2 fingers. Push the straw with your pointer finger with a quick thrust to make it fly. You might have to adjust the size of the loops, where they are placed, etc to make your plane fly. The thrust for your airplane is provided by the pushing motion of your pointer finger. The lift is provided by the air moving through the straw and the loops. Loop airplanes are fascinating because they are so simple. 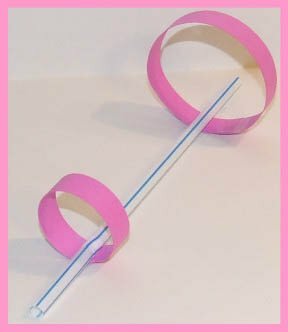 Kids have used multiple straws and flown them the length of a football field. More fun and easy experiments for you to try. Click on the white box to the left and sign up for our monthly newsletter. If you like this kids science e-zine please do a friend and me a big favor and "pay it forward" to someone else that might like to read it.